Freediving Gold Coast has been in operation for over 4 years and we have certified in excess of 200 students in this growing sport. We have our own commercial boat with only freedivers aboard enabling us to focus on teaching you the core freediving skills. Freedivers come first. See Our Boat. 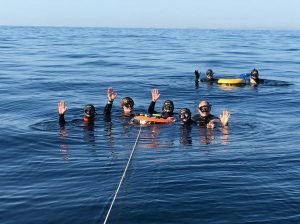 We are able to offer freediving from depths of 5 metres to 40 metres plus because it is our boat and we can go where we choose off the Gold Coast to cater for your specific needs. We do not rent our boat or places on a boat from other scuba diving schools. Therefore, we can cater to all freediving levels from beginner to elite freedivers. We believe the conditions off the Gold Coast are some of the best for freediving in Australia. Warm in summer and not too cold in winter with water visibility rarely below 10 metres and up to 30 metres. It is not uncommon to see a variety of marine life including dolphins swimming by and see whales or hear them underwater (during migration season July to September). All our courses are recognised and certified by AIDA International, the world body for freediving and the gold standard in freediving education. See AIDA – International Association for the Development of Apnea. Our Master Instructor (only two such instructors in Australia), Clinton Laurence, has post-graduate degrees in psychology and exercise science and consulted for the Australian Institute of Sport and the Queensland Academy of Sport in the role of sport psychologist. Our other Freediving Instructor, Cristy Gearon, is a teacher in secondary schools. You are receiving the highest level instruction with qualified professionals. We have the highest safety standards on all our courses in the pool and ocean. We have multiple systems in place to ensure your safety. See 100% Safety Commitment. After your course you can join the Freediving Gold Coast Club for no charge to continue to train your skills and connect with other like minded people. We are the longest running freediving club on the Gold Coast. You can hire all your freediving gear from us for your courses to try before you buy. We sell a range of specialised freediving gear to enable you to enjoy your freediving experience and to continue to dive safely. We take many photos on our courses which we post on social media to share with family and friends. If you want to take your freediving to the next level you can enter into our freediving competitions. Each year we organise a freediving holiday overseas to dive deeper, freer and safer. Are we the best freediving school in Australia? Strong words indeed but we don’t know of any freediving school in Australia that can offer you such a total freediving experience. Do your research. Compare our school to the others. Make an informed decision. What sets freediving apart from many sports is that you can’t hide behind physical movement and therefore freediving more closely reflects your mental state. If you are tense, stressed, tired, or simply finding it difficult to concentrate then your breath hold times will be affected. Of course all physical sports involve a mental component if not extreme degrees of concentration and other mental attributes in elite sport. But what sport involves doing nothing it appears but simply holding your breath? Do it now. Hold your breath for 30 seconds. What happens? You will become aware of your body and what parts are tense and relaxed. You will become aware of your thoughts – all of them. If something is bothering you it will be there. But then as breath hold increases another voice will start to appear, first in the periphery, but will start to invade consciousness. “I must breath”. “I have to breathe”. We start to feel anxious. Of course, here comes the choice, or decision if you like. “Do I breathe now?” Even this seemingly involuntary need to breathe we can exercise choice over. We do not need to act on our impulses. We can remain calm. This is the essence of freediving. This is the essence of life. Now imagine what it might be like in the cool, refreshing but weightless environment of water . 1 metre underwater? 5 metres underwater? 10 metres underwater? 20 metres underwater? Are you ready for the ultimate challenge? The ultimate experience? Join us on this adventure.